Diaa Bekheet | Washington, DC – In March 1994, American jazz drummer extraordinaire Tony Williams released a special album as a tribute to the man who discovered him, jazz legend Miles Davis. The album, A Tribute To Miles, is a collection of compositions celebrating the life and music of the iconic trumpeter and bandleader, Davis, who died in September 1991 and is widely considered one of the most influential musicians of the 20th century. A Tribute To Miles brought together a group of jazz icons, including pianist Herbie Hancock, saxophonist Wayne Shorter, bassist Ron Carter, hard bop, post-bop trumpeter Wallace Roney and Tony Williams who was famous for his use of polyrhythms and metric modulation. The sublime-sounding album won a Grammy award for Best Jazz Instrumental Performance – Individual or Group. 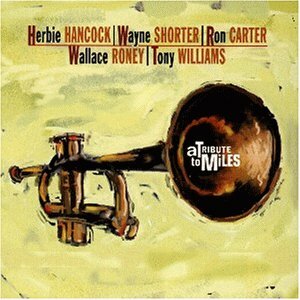 It’s a bit surprising that Wallace Roney sounded almost exactly like Miles Davis, with saxophonist Wayne Shorter balancing the trumpet. Tony Williams, Herbie Hancock, and Ron Carter completed the impressive performance with great virtuosity and strength. The album is a tour de force. Williams, who was considered the greatest jazz drummer of his era, died in California from a heart attack on February 23, 1997 at age 51. On the first anniversary of his death, I prepared a special Jazz Club USA show (for a Middle East audience) focusing on his album, Wilderness, which he released in 1996 in support of a clean and safe world environment. Also I talked about his album Young At Heart, which was released after his death. You will hear the title cut in full following my Arabic narration. Williams was born on December 12, 1945 in Chicago, Illinois. His father, Tillmon Williams, played saxophone and took him to music clubs to encourage his music interests. When Williams was eight years old, he began on drums, taking lessons from jazz drummer Alan Dawson. At the age 13, Williams began performing in concerts with the acclaimed clarinetist, saxophonist and bandleader Sam Rivers in Boston. At 17, Williams’ inventive playing highly impressed Miles Davis and attracted his attention. Davis hired him, and soon his quintet’s sound changed. Later, Davis described him as “the center of the group’s sound” in his biography. In 1964, Williams released his debut album, Life Time. Five years later, he formed his own R&B-jazz-rock fusion trio, The Tony Williams Lifetime, with John McLaughlin on electric guitar and Larry Young (aka Khalid Yasin Abdul Aziz) on organ and piano. The trio was very successful but short-lived. Its debut album, Emergency, is still considered a fusion classic. The group was disbanded in 1975, and innovative Williams formed another one: the New Tony Williams Lifetime. In addition to his performances with Miles Davis, Williams recorded and performed with other jazz legends, including drummer Art Blakey, guitarist and singer-songwriter Jimi Hendrix, saxophonist and composer John Coltrane, drummer Max Roach, and ex-Beatle Paul McCartney. I’ve been exploring for a little bit for any high-quality articles or weblog posts in this kind of area . Exploring in Yahoo I ultimately stumbled upon this web site. Studying this info So i’m happy to express that I have a very excellent uncanny feeling I came upon exactly what I needed. I most unquestionably will make certain to don?t forget this web site and give it a glance regularly. Still have a few problems but I WILL WORK THROUGH THEM. Incredible blog! I must say i love and also such as precisely how it is effortless in my personal eye and also the information are generally well crafted, easy to read, thanks. As a non-musician, I am wondering if all the other musicians in a group tune their instruments to the piano before they begin? This is the only instrument which is pretty “inflexible” when you get going!!! Great article!! Over a long distance, you learn about the strength of your horse; over a long period of time, you get to know what’s in a person’s heart. As someone who has taught social ethics for thirty years, I think it is important but I am not convinced that teaching the subject makes us any more empathetic or responsible in our behaviours. Do we have evidence-based data to prove me wrong? Are what are we teaching should it be ethical absolutism (one set of common beliefs for all) or moral relativism (when in Rome do what the Romans do)?